These brand new all-plastic playing cards are made of the highest quality PVC plastic for long use. 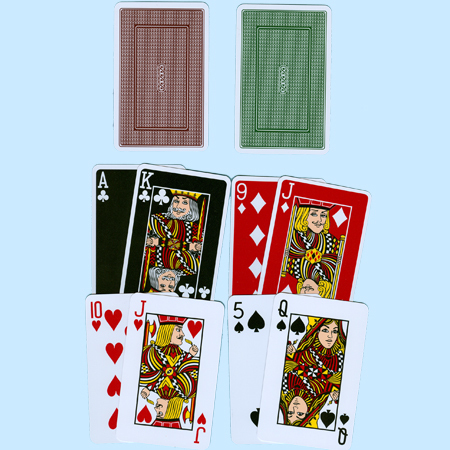 TURBO Plastic Playing Cards come in two-deck sets with green and brown backs and a unique face design with regular index numbers and pips. The Diamond and Club card faces feature red and black overall coloration, and the Spades and Hearts have a traditional white background. Turbo Plastic Decks are like nothing you'll find anywhere – they are virtually guaranteed to super-charge your game!